’tis the season to be busy. And the sewing room is no different. I needed something festive on my front porch. To keep from looking like a Scrooge residence from the street. So I pugged in a pre-lit Christmas tree and plopped it in front of the window. Of course, only the lights on the top and bottom came on. Back to the attic I went to dig out strands of lights to add to my tired old tree. So if you come to my front porch, please don’t look too closely. It is better appreciated from a distance. After the tree was sufficiently twinkling, I decided the porch needed a little something else. Pillows for the rocking chairs on either side of the tree. This is our Zippered Throw Pillow from our Beinning Sewing 101 class; I added the appliquéd letters. And I did it the “old fashioned way.” No embroidery machine. Just my Pfaff sewing machine, which does a very nice satin stitch. But after P – E, I was really wishing I had one of those nice embroidery machines like Karen and Jill and Jenae and Penny and Millee have. 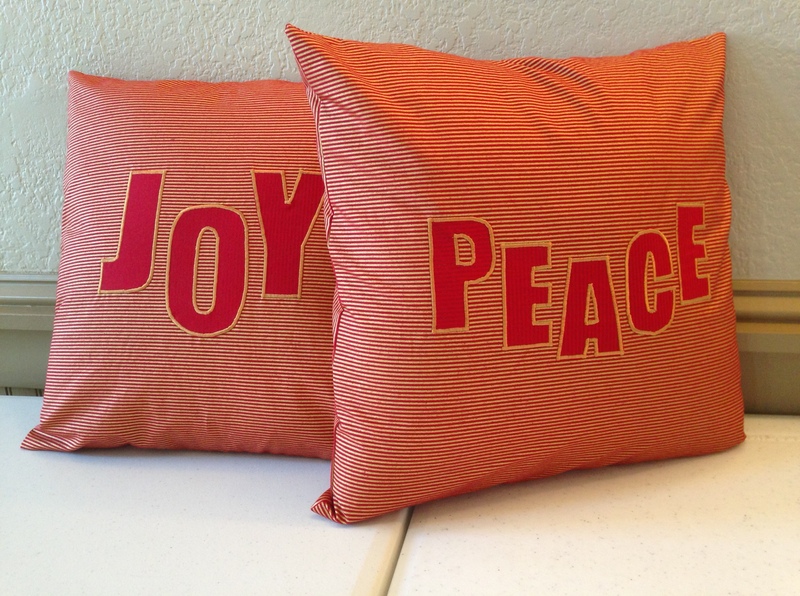 I know I could have found “JOY” and “PEACE” patterns with holly vines or Christmas lights intertwined. Or angels or stars. I wonder if it’s too late to sit on Santa’s knee?